[Update 2018] This article has been substantially updated since it was published in 2013. In this article, I will show you how to setup a Linux-based OpenVPN server. 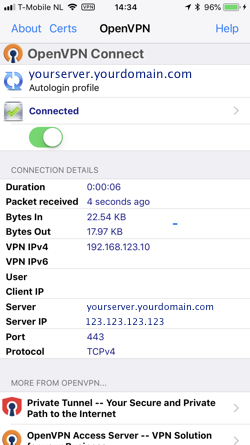 Once this server is up and running, I'll show you how to setup your iOS devices, such as your iPhone or iPad so that they can connect with your new VPN server. The goal of this effort is to encapsulate all internet traffic through your VPN connection so no matter where you are, nobody can monitor which sites you visit and what you do. This is ideal if you have to visit the internet through untrusted internet sources like public Wi-Fi. Your iOS devices will be running OpenVPN Connect, a free application found in the App store. A note on other platforms: Although this tutorial is focussed on iOS devices, your new OpenVPN-based VPN server will support any client OS, may it be Windows, MacOS, Android or Linux. Configuration of these other clients is out-of-scope for this article. This tutorial is based on OpenVPN, an open-source product. The company behind OpenVPN also offers VPN services for a price per month. If you find the effort of setting up your own server too much of a hassle, you could look into their service. Please note that I have never used this service and cannot vouch for it. OpenVPN is an SSL-based VPN solution. SSL-based VPNs are very reliable because if you set it up properly, you will never be blocked by any firewall as long as TCP-port 443 is accessible. By default, OpenVPN uses UDP as a transport at port 1194, but you can switch to TCP-port 443 to increase the chance that your traffic will not be blocked at the cost of a little bit more bandwidth usage. Authentication is based on public/private key cryptography. The OpenVPN server is similar to an HTTPS server. The biggest difference is that your device doesn't use a username/password combination for authentication, but a certificate. This certificate is stored within the client configuration file. So before you can configure and start your OpenVPN service, you need to setup a Certificate Authority (CA). With the CA you can create the server certificate for your OpenVPN server and after that's done, generate all client certificates. OpenVPN is available on most common Linux Distros by default. apt-get install openvpn for any Debian or Ubuntu version is all you need to install OpenVPN. This script seems to automate a lot of steps, like firewall configuration, certificate generation, etc. It's out-of-scope for this tutorial, but you should make sure that you keep your OpenVPN software up-to-date, in case security vulnerabilities are discovered in OpenVPN in the future. I'm creating this tutorial on an older system, with less secure default configuration settings for both the Certificate Authority as the OpenVPN server itself. The settings I use in this tutorial are based on the steps in this blog. I did some performance tests and got around 40-50 Mbs per iOS client. 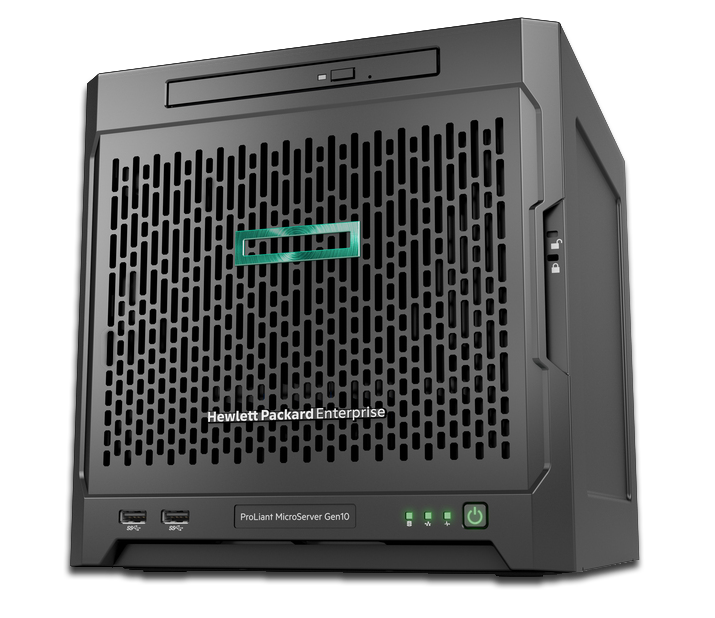 I believe that the bottleneck lies with my old HP Microserver N40L with its relatively weak CPU. If you want to limit how much bandwidth a client is allowed to use, I recommend to use this tutorial. I have tried it out and it works perfectly. For unbuntu: install the package "easy-rsa" and use the 'make-cadir' command instead of the setup instructions below. I assume that you will setup your OpenVPN configuration in /etc/openvpn. Before you can setup the server configuration, you need to create a certificate authority. I used the folder /etc/openvpn/easy-rsa as the location for my CA. Please note that depending on your Linux flavour, these files may be found at some other path. Next, we cd into the destination directory. Now, open the 'vars' file with your favorite text editor. The following instructions are straight from the OpenVPN howto. You should change all the values to ones that apply to you (obviously). Then I had to copy openssl-1.0.0.cnf to openssl.cnf because the 'vars' script complained that it couldn't find the latter file. Notice I went through these steps on an older Linux installation. I had to edit the file /etc/openvpn/easy-rsa/pkitool and changed all occurrences of 'sha1' to 'sha256'. Now we 'source' var and run two additional commands that actually generate the certificate authority. Notice the dot before ./vars. You will have to confirm the values or change them if necessary. Now we have a certificate authority and we can create new certificates that will be signed by this authority. WARNING: be extremely careful with all key files, they should be kept private. By default, OpenVPN runs as root. With these commands, only the root user will be able to access the keys. If you don't run OpenVPN as root, you must select the appropriate user for the first command. See also this article. It's up to you to come up with an alternative for 'server'. This is the file name under which the key files and certificates are stored. All files that are generated can be found in the '/etc/openvpn/easy-rsa/keys' directory. This is just a flat folder with both the server and client keys. This step is optional but it doesn't take much effort and it seems to add an additional security layer at no significant cost. In this step we create an additional secret key that is shared with both the server and the clients. The following steps are based on this article (use of -tls-auth). When we are going to create the server configuration, we will reference this key file. Now that we have a server certificate, we are going to create a certificate for our iPhone (or any other iOS device). So now we have everything in place to start creating an OpenVPN configuration. We must create a configuration for the server and the client. Those configurations are based on the examples that can be find in /usr/share/doc/openvpn/examples/. I believe you should be able to use this configuration as-is. Depending on your local IP-addresses within your own network, you may have to change the server section. I use TCP-port 443 as this destination port is almost never blocked as blocking this port would break most internet connectivity. (The downside is that I can no longer host any secure web site on this IP-address). The OpenVPN service will provide your client with an IP-address within the address range configured in the 'server' section. If you want to use your VPN to browse the internet, we still need to configure a basic firewall setup. I'm assuming that you already have some kind of IPtables-based firewall running. Configuring a Linux firewall is out-of-scope for this article. I will only discuss the changes you may need to make for the OpenVPN service to operate properly. You will need to accept traffic to TCP port 443 on the interface connected to the internet. If your OpenVPN server is behind a router/firewall, you need to configure port-forwarding on that router/firewall. How to do so is out-of-scope for this article, as it is different for different devices. Assuming that you will - for example - use the 10.0.0.0/24 network for VPN clients such as your iPhone, you must also create a NAT rule so VPN clients can use the IP-address of the Linux server to access Internet. Please note that you must change eth0 with the name of the appropriate interface that connects to the internet. Change the IP-address range according to your own situation. It should not conflict with your existing network. Most OpenVPN clients can automatically import files with the .ovpn file extension. A typical configuration file is something like 'iphone.ovpn'. Warning: the .ovpn files will contain the certificate used by your iPhone/iPad to authenticate against your OpenVPN server. Be very carefull where you store this file. Anyone that is able to obtain a copy of this file, will be able to connect to your VPN server. This is an example configuration file, but we are not going to create it by hand, it's too much work. You can create your client configuration file manually but that is a lot of work. Because you need to append all the certificates to a single file, that also contains the configuration settings. So we will use a script to setup the client configuration. First we are going to create a folder where our client configuration files will be stored. Now we will download the script and the accompanying configuration template file. Notice that the links may wrap. Please note that you first need to create the certificates for your devices before you can generate a configuration file. So please go back to that step if you need to. Also take note of the name you have used for your devices. You can always take a look in /etc/openvpn/easy-rsa/keys to see how your devices are called. Now you are ready to run the script and generate the config file for your device. When you run this script, a configuration file is generated and placed in to the folder /etc/openvpn/clientconfig. 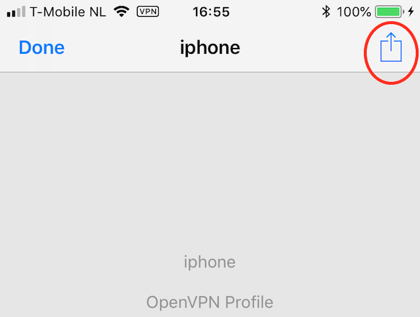 You should now find a file called 'iphone.ovpn' in the directory /etc/openvpn/clientconfig. We are almost there. We just need to copy this file to your iOS device. First install the OpenVPN Connect application if you haven't done so. 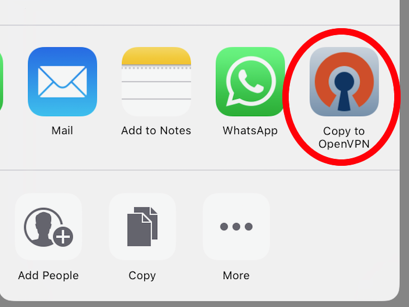 Copy the .ovpn file from your OpenVPN server to your iCloud Drive. Take your device and use the 'files' browser to navigate within your iCloud drive to the .ovpn file you just copied. Tap on the file to download and open it. When you get the question "OpenVPN would like to Add VPN Configurations", choose 'Allow'. Continue with the step 'Test your iOS device'. If the OpenVPN Connect client doesn't import the file, remove the application from the device and re-install it. (This is what I had to do on my iPad). You can skip this step if you used iCloud Drive to copy the .ovpn profile to your device. Copy this file from your OpenVPN server to the computer running iTunes. Then connect your device to iTunes with a cable. Open the OpenVPN client. You will see a notice that a new configuration has been imported and you need to accept this configuration. As it might not work straight away, you need to monitor /var/log/openvpn.log on the server to watch for any errors. Now try to connect and enjoy. You should be able to keep your VPN enabled at all times because battery usage overhead should be minimal. If you are unable to connect to your VPN when you are at home behind your own firewall, you need to check your firewall settings. Updated 20130123 with keepalive option. Updated 20130801 with extra server push options for traffic redirection and DNS configuration Updated 20180618 as substantial rewrite of the original outdated article. As a home user, I'm mainly interested in setting up a high bandwidth link between two servers. So I've decided to take a gamble on some InfiniBand gear. You only need InfiniBand PCIe network cards and a cable. I find $66 quite cheap for 20 Gbit networking. Regular 10Gbit Ethernet networking is often still more expensive that using older InfiniBand cards. InfiniBand is similar to Ethernet, you can run your own protocol over it (for lower latency) but you can use IP over InfiniBand. The InfiniBand card will just show up as a regular network device (one per port). I've followed these instructions to get IP over InfiniBand working. Please take note of the 'mode' setting. The 'datagram' mode gave abysmal network performance (< Gigabit). The 'connected' mode made everything perform acceptable. The MTU setting of 65520 improved performance by another 30 percent. I've tested the card on two systems based on the Supermicro X9SCM-F motherboard. Using these systems, I was able to achieve file transfer speeds up to 750 MB (Megabytes) per second or about 6.5 Gbit as measured with iperf. Testing was done on Debian Jessie. During earlier testing, I've also used these cards in HP Micro Proliant G8 servers. On those servers, I was running Ubuntu 16.04 LTS. Using these systems, I was able eventually able to achieve 15 Gbit as measured with iperf, although I have no 'console screenshot' from it. IP over InfiniBand seems to be a nice way to get high-performance networking on the cheap. The main downside is that when using IP over IB, CPU usage will be high. Another thing I have not researched, but could be of interest is running NFS or other protocols directly over InfiniBand using RDMA, so you would bypass the overhead of IP.